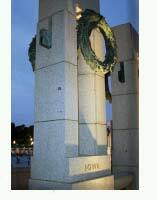 Honor Flight Network is a non-profit organization created solely to honor American's veterans for all their sacrifices. We transport our heroes to Washington, D.C. to visit and reflect at their memorials. Top priority is given to the senior veterans - Korean War survivors. The Inaugural Honor Flight took place in May of 2005. Six small planes flew out of Springfield, Ohio, taking twelve veterans on a visit to the memorial in Washington, D.C. The Honor Flight Network program was conceived by Earl Morse, a physician assistant and Retired Air Force Captain.